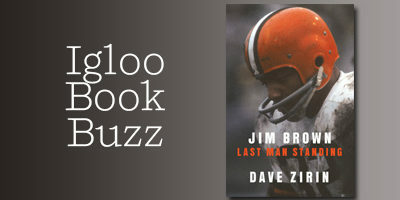 “The challenge in writing this book comes with the search for balance as I attempted to draw out the lessons of Jim Brown’s life. Brown is somebody with diehard supporters and detractors. I was not looking to build him up or tear him down: just to distill some of the lessons from his remarkable life. I know there will be people who say I’m too hard on him and there will be people who think I’m too soft. Knowing that this kind of criticism is in my future is a challenge unto itself. Jim Brown is recognized as perhaps the greatest football player to ever live. But his phenomenal nine-year career with the Cleveland Browns is only part of his remarkable story, the opening salvo to a much more sprawling epic. Brown parlayed his athletic fame into stardom in Hollywood, where it was thought that he could become “the black John Wayne.” He was an outspoken Black Power icon in the 1960s, and he formed Black Economic Unions to challenge racism in the business world. For this and for his decades of work as a truce negotiator with street gangs, Brown – along with such figures as Muhammad Ali, Bill Russell, and Billie Jean King – is revered as a socially conscious athlete. At eighty-one years old, he continues to speak out and look for fights. His recent public support of Donald Trump and criticism of Colin Kaepernick are just the latest examples of someone who seems restless if he is not in conflict.